Welcome to EVE Online! Start by completing the tutorial. Don’t be afraid! 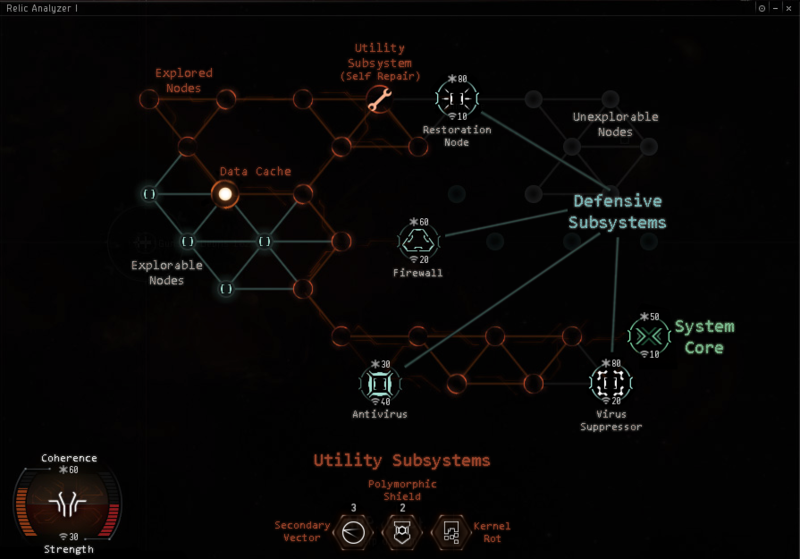 The tutorial is designed to teach you how to play EVE, not to punish you. Make sure to follow AURA’s instructions carefully. 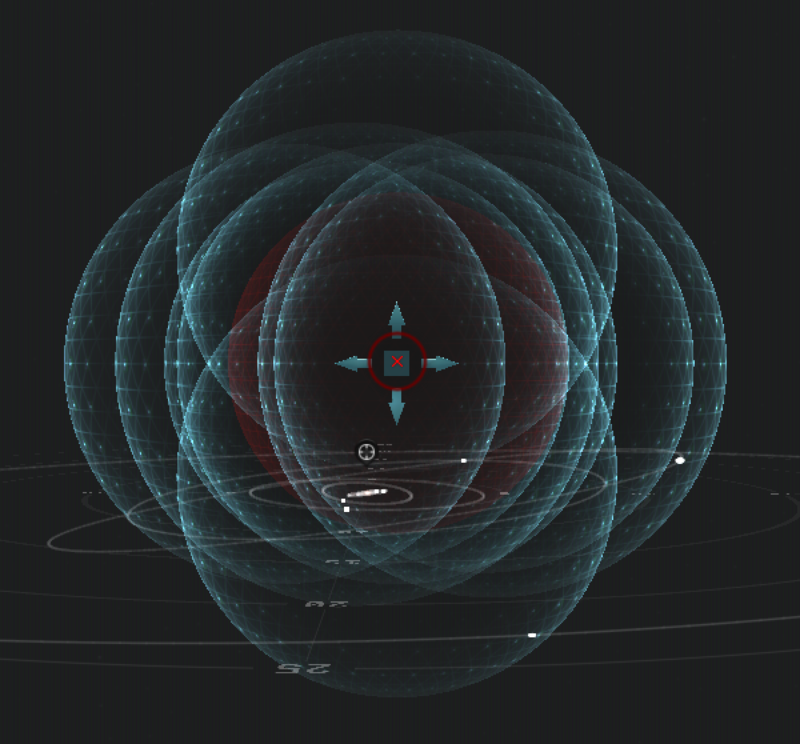 Keep your repair modules active, and remember to orbit your targets when engaging enemy combatants. Once the main tutorial is complete, it’s time for you to make some ISK. By far, the best way to make the first of your ISK to PLEX alpha clone is through exploration. Once you have some starting capital (around 100 million ISK), start station trading to make the most of it while you continue to explore. Exploration for an alpha clone involves scanning and completing data and relic sites. As of the writing of this post, relic sites are far superior to data sites in terms of ISK. Exploration is fairly straightforward: simply scan down a site, and hack the containers within it. The ship you use will vary depending on the race you chose when creating your character. The Caldari Heron seems to be the best T1 exploration frigate, but each faction has its equivalent. Either way, your exploration fit will be fairly straightforward. In your high slots, fit a core probe launcher (if you have the ISK, a Sister’s Core Probe Launcher will provide you with a scan bonus). Alpha clones cannot fit a cloaking module, so don’t worry about that for now. In the mid slots, fit a Microwarpdrive (5MN Cold-Gas Enduring Microwarpdrive if you can afford it; if not, a 5MN Microwarpdrive I will suffice). Also fit a Relic Analyzer I and a Data Analyzer I. If you have an extra mid slot, fit a Scan Rangefinding Array I, which increases scan strength to make finding sites easier. In your low slots, fit two Warp Core Stabilizers to help prevent getting ganked. Fill the rest of your lows with Nanofiber Internal Structure to decrease your align time. For your rigs, use Small Gravity Capacitor Upgrade to increase your scan strength further. This will make scanning down sites even easier. While exploration in high security space can be profitable, your income will increase greatly in low or null security space. Try to look for an empty low security system to start out in, and later progress to null security, if you feel brave. Do not be afraid to lose your ship; one relic or data site can likely cover the entire cost of your ship and fittings. Remember to keep an eye on your local chat when in space. The members list of the local chat window will show you everyone else in the system. Be wary of running a site if another person is present in the system, as they can easily destroy your ship. With your probe scanner open, jump from system to system until you see cosmic signatures in your scan results menu. The presence of these cosmic signatures indicates a site that you can scan down. My strategy for safety is to launch my probes, warp to the system’s sun at 100km, and double click in a random direction. The double click will get your ship moving away from the warp in point. This will give you more time to escape should someone attempting to hunt you warp to the sun as well. Launch your probes in pinpoint formation. Pick a cosmic signature, and center your probes on that signature’s location. Set the probe size just high enough that you can cover the entirety of the signature’s volume (8 AU usually does the trick). Scan the signature, and then reposition your probes accordingly. Once the scan signal level stops increasing, decrease the probe size in order to focus in on the signature. After reaching 25% signal strength, the site’s type will become visible. If the site is not a relic or data site, right click it, choose “Ignore Result”, and continue to the next signature. With your ship, you should only run data and relic sites for maximum ISK with minimal risk. Continue scanning, repositioning, and decreasing probe size until the signature’s signal reaches 100%. It is at this point that you can warp to the signature to begin hacking. Once you’ve entered the site, select any of the containers near you. Approach the container, using your Microwarpdrive to close the distance quickly. Remember to keep an eye on local chat to ensure that the system is clear of threats. If there are threats in the system, dock up (if possible), or move onto another system. Acquire a target lock on the container and activate your data or relic analyzer, depending on the type of the site. The hacking minigame will appear. This may seem daunting at first, but once you understand the basics, it becomes a piece of cake. The hacking minigame allows you to inject a virus into the container. Using this virus, your goal is to locate and hack the System Core. Each time you click an uncovered node, a number will appear. This number is the number of nodes away the nearest point of interest is. Points of interest are data caches, utility subsystems, and the system core. In addition to these three, there are various defensive subsystems that you may accidentally uncover that will hinder your progress. These will be covered in detail below. Your virus, as well as each defense subsystem, has two stats: strength and coherence. You can consider strength to be your attack value, and coherence to be your health. Strength is the amount of coherence you will remove from a defensive subsystem upon attacking it, and coherence is the amount of health you have before your hacking attempt fails. Each defensive subsystem also has its own strength and coherence values. After two failed hacking attempts, the target container will explode, destroying all loot. This explosion will not deal any damage to you. There are four types of containers per combat or relic site, each with a varying difficulty and proportional reward. See the following tables, as created by EVE University, for information on difficulty. There are four defensive subsystems you may encounter while hacking a container. Firewall – this subsystem has a high coherence (health), but low strength (attack). This subsystem has no special effect, but should not be attacked unless necessary to progress in the minigame. It is found in all container difficulties. Antivirus – this subsystem has a medium coherence (health), but high strength (attack). This subsystem has no special effect, but should not be attacked unless necessary to progress in the minigame. It is found in all container difficulties. Restoration Node – this subsystem has a high coherence (health), but low strength (attack). Each turn, this subsystem will increase a random defensive subsystem’s coherence. Restoration nodes should be dealt with swiftly, as they can make an otherwise harmless subsystem nearly impossible to destroy. These subsystems are found in medium and hard containers. Virus Suppressor – this subsystem has a high coherence (health), but low strength (attack). This subsystem will decrease your virus’s strength. If this subsystem appears, avoid attacking any subsystem unless absolutely necessary. These subsystems are found only in hard containers. There are four utility subsystems you may encounter while hacking a container. You may carry up to three utility subsystems at a time. Self Repair – this subsystem will increase your virus’s coherence each turn for 3 turns. The amount restored depends on the difficulty of the container, as well as your current coherence. This subsystem should be activated as soon as it is acquired, in order to free up space. It is found in all container difficulties. Kernel Rot – this subsystem will cut the system core or a defensive subsystem’s coherence in half. It is best used against subsystems with a high coherence. It is found in all container difficulties. Polymorphic Shield – this subsystem will shield your virus from the damage it would have suffered from the next two attacks. You should activate it as soon as you get it, since activating it costs one turn, which could be detrimental when facing a restoration node. It is found in medium and hard containers. Secondary Vector – this subsystem will reduce the coherence of a defensive subsystem or the system core by 20 each turn for 3 turns. It should be used against a virus suppressor, unless it is necessary to use it against another subsystem. It is found only in hard containers. Data caches are nodes that, when uncovered, reveal white dots. A data cache can contain a utility subsystem, but more often than not will contain a defensive subsystem. It is in your best interest to avoid opening a data cache unless all other node paths are closed. When hacking a container, it is very useful to follow the rule of sixes. A node that is connected to six other nodes is a “safe” node, which likely will not contain a defensive subsystem. If you click on a “safe” node and encounter a defensive subsystem, this means that the system core is 1 node away from the safe node. The general strategy you should employ when hacking is simple. Locate the nearest “safe” node, and plot a path to it. Continue exploring as many safe nodes as possible, ignoring all defensive subsystems, except restoration nodes. Once all node paths are fully explored, you should begin destroying defensive subsystems. As a rule of thumb, the system core will likely be located in the minigame on the opposite end of the point at which you began. Once you uncover the system core, destroy it in order to gain access to the container. Loot the container, but keep a lookout for low value, high volume loot, such as Carbon, Spare Parts, Power Couplings, and Electronic Links. These modules should be jettisoned if you run out of cargo during a long exploration run. When scanning, keep a lookout for wormholes. If you discover a wormhole, scan it down and warp to it at 100km. Right clicking the wormhole and clicking show info will tell you about the wormhole’s type. A K162 wormhole is a wormhole to high security space. You should use these wormholes in order to travel safely back to Empire space in order to sell your loot. After making a few dozen million ISK through exploration, you should begin investing this ISK in the market. Do so by parking an alt character in a trade hub, such as Jita, Rens, or Amarr, and engaging in station trading. Station trading involves flipping items on the market for a profit, and is quite straightforward once you understand the basics. This is the most effective way to grow your wallet while you are logged out of the game. An overview on how to begin station trading can be found here. Use this guide to invest your wealth, and you can begin making hundreds of millions of ISK each week. Below is a video guide that simplifies station trading. Using these methods, you can expect to PLEX alpha clone within a matter of weeks, if not days, depending on your play schedule. If you have any questions, feel free to comment below.